Your library of Disney movies can now go wherever you and your kids do, regardless of what platform you purchased them on. 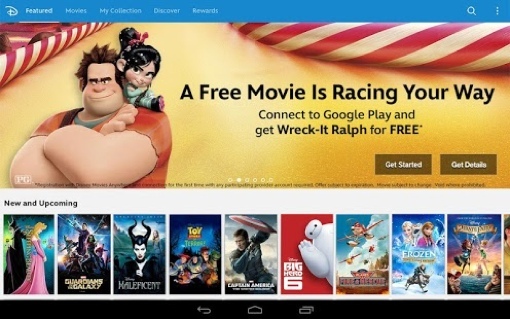 Today, Google and Disney formed a new partnership to finally launch its Disney Movies Anywhere service on Android. With the new tablet and smartphone app, you’ll be able to watch your full collection of Disney movies on Android, even if you purchased a disc in a store or a digital copy on Apple iTunes. Disney Movies Anywhere has been available for iOS since earlier this year. "We want to make it easy for movie fans to enjoy all of their past and future digital purchases across all of their devices. Our partnership with Disney now gives Google Play users the ability to conveniently watch all of their Disney, Marvel and Pixar digital movies that have been purchased from any Disney Movies Anywhere participating retailer," says Jonathan Zepp, head of Google Play Movies partnerships. Once you link your Google account with your Disney account through Disney Movies Anywhere, any films you’ve already purchased on Apple iTunes will instantly be made available for free through the Disney Movies Anywhere app on iOS or Android. If you’ve purchased a Disney movie recently, you’ve likely also received a digital copy code. This can be entered into the service too, building your digital collection and giving you streaming access to the movie on mobile devices even when away from home. You can also stream movies from the Disney Android app to a TV using a $39 Google Chromecast device, or to your Roku using the Google Play Roku app. There’s a bit more to the app than just being able to access your movie collection. There are previews for future releases and hours of new exclusive content. You can also earn Disney Movie Rewards points redeemable for small toys, plushies, DVDs and more. And if you’re new to the app, you can redeem a free digital download of the fun video game-themed movie Wreck-It Ralph for a limited time. If you’re a big a Disney family, the app is a pretty great way to take your existing movie collection mobile without paying fees. Sure, some of your older DVDs and VHS tapes might not qualify for free streaming. But moving forward, if you buy Disney content, you know that it’ll be platform agnostic – you’ll be able to watch your movie even if you switch smartphone platforms or if the service you bought the movie through goes out of business. You can check out the free Disney Movies Anywhere app on the Apple App Store for iOS and on Google Play for Android devices.